The postponed launch of the space shuttle Endeavour on Friday (April 29) was not only disappointing for the thousands of spectators that flocked to the Florida coast to see the historic liftoff; the delay also carries a large price tag, NASA officials say. "It's the cost of propellant," NASA spokesman Allard Beutel told SPACE.com. "We capture most of the propellant back, and recycle it and use it again, but some of it gets boiled off. The propellant is really the cost." The bulk of the costs associated with a so-called scrubbed launch attempt come from the cryogenic liquid hydrogen and liquid oxygen propellant, and various personnel expenses. "It's contained in the overall budget," Beutel said. "It's still within the overall budget, but there are costs associated with the propellant." 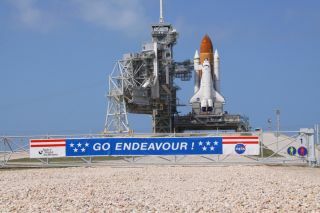 Endeavour was fully fueled on the launch pad at Kennedy Space Center in Cape Canaveral, Fla., when NASA called off today's launch attempt due to an issue in one of the spacecraft's critical power units. The agency is now targeting no earlier than Monday (May 2) at 2:33 p.m. EDT (1733 GMT) for its next attempt. A recent study of 30-year space shuttle program concluded that once the program retires this year, NASA will have spent nearly $200 billion on its 135 space shuttle missions. NASA's first shuttle flight, STS-1, launched on April 12, 1981. Endeavour's upcoming flight is dubbed the STS-134 mission. One more mission, STS-135, is scheduled to fly in late June aboard the shuttle Atlantis. The recent analysis, performed by science policy expert Roger Pielke Jr., and research associate Radford Byerly, concluded that the average cost of a NASA space shuttle flight is about $1.2 billion once lifetime costs of the reusable orbiter fleet are factored in. Endeavour was slated to blast off toward the International Space Station to deliver a $2 billion astrophysics experiment and a slew of supplies. Two heaters on one of Endeavour's auxiliary power units, which power hydraulics systems on the shuttle during its return to Earth, failed this morning, prompting today's launch delay. Though Endeavour has a total of three units, NASA needs working spares of these critical systems, mission managers said. The six-astronaut crew included commander Mark Kelly, the husband of wounded Congresswoman Gabrielle Giffords. The Arizona politician is recovering from a bullet wound that she received during a mass shooting at a constituent meeting outside a Tucson, Ariz., grocery store on Jan. 8. Giffords was in attendance at Kennedy Space Center to watch her husband's launch. President Barack Obama and his family had also planned to view Endeavour's final liftoff. NASA estimated that up to 750,000 spectators would be on hand for Endeavour's launch. Endeavour's STS-134 flight will be the last mission for the youngest orbiter in NASA's fleet. Following the 14-day mission, Endeavour will be retired from service and eventually put on display at the California Science Center in Los Angeles.